Influenster recently sent me the Marc Jacobs Beauty Dew Drops Coconut Gel Highlighter for free to test and review and oh boy! It's gorgeous! This highlighter came out as part of Marc Jacob's Coconut Collection and it's described as a "golden peach" gel/liquid highlighter. Besides using it as a highlighter, this product can also be mixed in with other base products to create an all over subtle dewy look. There are 0.8 ounces / 24 mL of product and retails for $44. The packaging is so incredibly nice. It's a frosted glass bottle with a pump and can we talk about how much product there is?! It's almost like a full bottle of foundation. I'm kind of on the fence about the pump though. Since it is a highlighting product, the pump didn't really help me control the amount of product. It always pumped out a bit too much how matter how gently I pressed the pump. I'm actually surprised at how much I liked the color. I honestly wasn't that into this product when I saw all the promo pictures because I thought the tone was going to look too off or too yellow on my face. When I got the email from Influenster saying that I got this VoxBox, I still wasn't too excited. It wasn't until I swatched it and applied it on my face that I started to love it. The texture feels thicker than the Becca Liquid Shimmering Skin Perfectors and is kind of like a step down from a cream. You could probably use your fingers to blend this out, but I prefer using a slightly dampened sponge. I noticed that I would get slightly patchy spots of shimmer when I would use something dry like a non-dampened sponge or brush as well. In the above picture, I had a tiny bit mixed into my foundation and then I applied more on my cheek bones for the lifted glow. I'm thinking that this duo of pictures is kind of weird in that the differences are pretty stark, but I wanted to show how the highlighter would look with direct artificial light and indirect natural light. Liquid and more "wet" products like this highlighter tend to shine more for me in direct light, but I wasn't expecting the indirect sunlight version to look so subtle in comparison. I'm not hating on the subtleness of it since it's still gorgeous though. Because of the way I apply the product (dampened sponge), it does make the shimmer more subtle and absolutely perfect for work and normal day life. You could also layer on more of the product too to make the highlight more blinding depending on your preference. The highlight sets to an almost matte texture but with all the shine. This is definitely something you don't need to set with a powder highlight, but you definitely can since it won't grab onto the product to make it patchy. 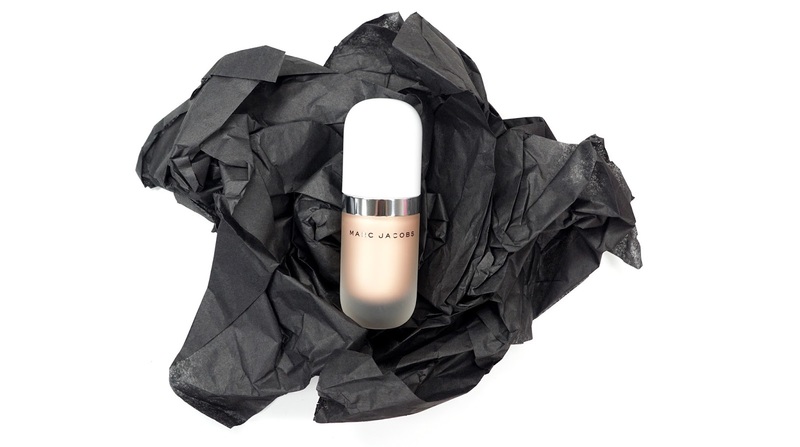 The powder will just glide over the liquid and add more glow to your face. It might just be me, but I'm not a huge fan of fake coconut. I had a bad experience with some fake coconut drink and I've been very blech about it ever since. I can smell some of the fake coconut in this product, but there's also some kind of citrus to it too. It kind of bothers me, but it's not that close to my nose and so I don't notice it too much. Final thoughts: I do really like this product and enjoy using it, but the price is definitely tough to swallow. It's one of the main reasons I didn't purchase it myself before getting this package from Influenster. Even though I'm in awe about the amount of product, I could get the same effect from my Pony Effect Strobing Luminizer or Becca Shimmering Skin Perfector (liquid) and they're both more affordable choices. 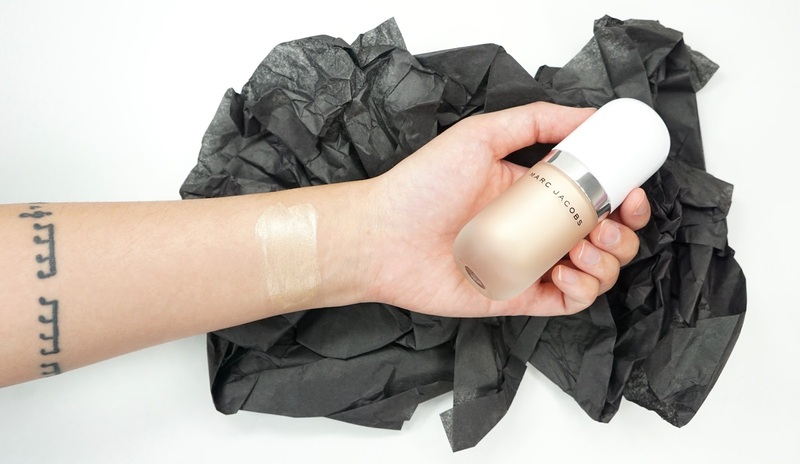 On one hand, I do like the Marc Jacobs Beauty Dew Drops Coconut Gel Highlighter and do give it a huge thumbs up, but I wouldn't say that it's worth the money. 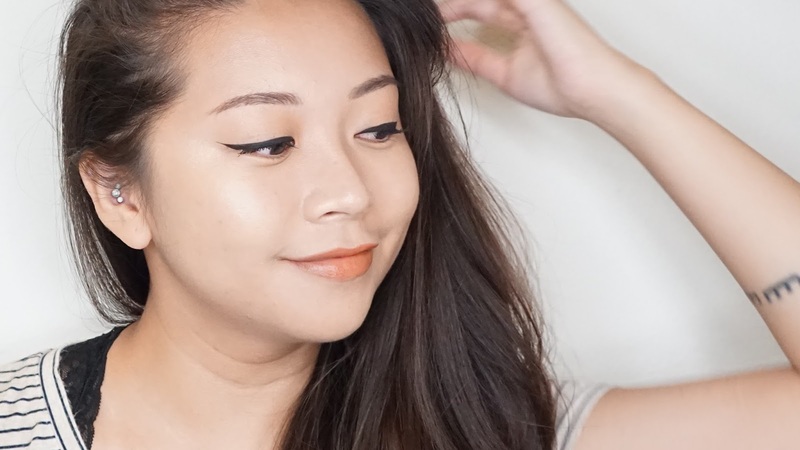 Have you tried out this highlighter? What are your thoughts on liquid highlighters? *As mentioned, Influenster did send me this product for free in one of the VoxBoxes. I did not receive any payment (besides this free product) and all thoughts are 100% my own.